The fire ... surrounds the lab complex and adjacent town of Los Alamos on three sides. A wildfire that is threatening the nation’s premier nuclear weapons laboratory ... is poised to become the largest fire in state history. You've heard that potassium iodide helps protect against some types of radiation. In fact, it only protects against iodine 131 poisoning (and, if not needed, may cause severe adverse reactions in some individuals). But there are actually different treatments for different types of radiation. The FDA has determined that the 500 mg Prussian blue capsules, when manufactured under the conditions of an approved New Drug Application (NDA), can be found safe and effective for the treatment of known or suspected internal contamination with radioactive cesium, radioactive thallium, or non-radioactive thallium. This decision is based on a careful review of published literature articles containing reports, data, and experiences of people who were exposed to high levels of thallium or cesium-137 and were treated effectively with Prussian blue. Prussian blue works using a mechanism known as ion exchange. Cesium or thallium that have been absorbed into the body are removed by the liver and passed into the intestine and are then re-absorbed into the body (entero-hepatic circulation). Prussian blue works by trapping thallium and cesium in the intestine, so that they can be passed out of the body in the stool rather than be re-absorbed. If persons are exposed to radioactive cesium, radioactive thallium, or non-radioactive thallium, taking Prussian blue may reduce the risk of death and major illness from radiation or poisoning. 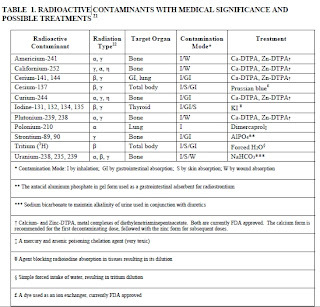 The FDA has determined that Ca-DTPA and Zn-DTPA are safe and effective for treating internal contamination with plutonium, americium, or curium. 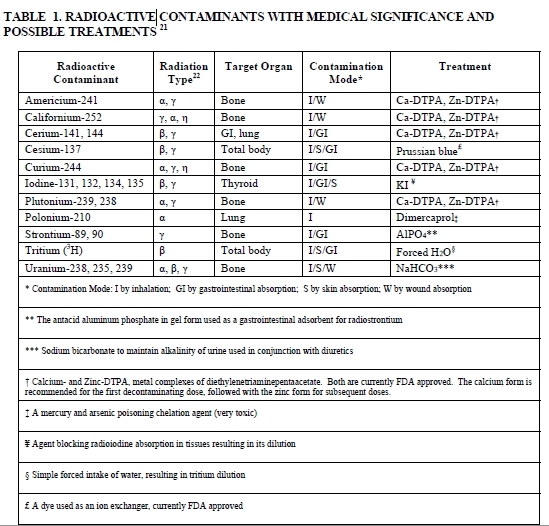 The drugs increase the rate of elimination of these radioactive materials from the body. Uranium contamination has been treated with oral sodium bicarbonate, regulated to maintain an alkaline urine pH, and accompanied by diuretics. Oral sodium bicarbonate has not been approved in the United States for this indication. Sodium bicarbonate is baking soda. While I have no idea whether it is true or not, many alternative people advocate bathing in baking soda after being exposed to uranium. Note: I am not a medical professional and this does not constitute medical or health advice. This is for general informational purposes only. Some or all of the above-described substances may have severe side effects or - if used improperly - may cause more damage than they prevent. Don't take any of these preventatively ... only if exposed to high levels of radiation. Consult your doctor before taking any of the above medicines. A raging wildfire is threatening to engulf the Los Alamos National Laboratory. Los Alamos has likely tested more nuclear weapons than any other facility in the world. The anti-nuclear watchdog group Concerned Citizens for Nuclear Safety, however, said the fire appeared to be about 3 1/2 miles from a dumpsite where as many as 30,000 55-gallon drums of plutonium-contaminated waste were stored in fabric tents above ground. The group said the drums were awaiting transport to a low-level radiation dump site in southern New Mexico. Lab spokesman Steve Sandoval declined to confirm that there were any such drums currently on the property. Lab officials at first declined to confirm that such drums were on the property, but in a statement early Tuesday, lab spokeswoman Lisa Rosendorf said such drums are stored in a section of the complex known as Area G. She said the drums contain cleanup from Cold War-era waste that the lab sends away in weekly shipments to the Waste Isolation Pilot Plant. She said the drums were on a paved area with few trees nearby and would be safe even if a fire reached the storage area. Officials have said it is miles from the flames. The Los Alamos Study Group alleges that the waste is not all from the Cold War, because the facility is cranking out more nuclear weapons than ever. The lab has called in a special team to test plutonium and uranium levels in the air as a "precaution". A small offshoot of the blaze jumped State Highway 4 onto the lab grounds on Monday, burning about an acre (0.4 hectare) of property before it was extinguished about two hours later. Authorities also are worried about potential radiation releases from nearby canyons. Radioactive material from nuclear tests was deposited in the canyons decades ago, and if trees in those canyons go up in flames, they could release radiation into the air, said Rita Bates, an air-quality official with the New Mexico Environment Department. That could raise the "potential for that smoke to affect people's health," she added. I'm on the road this week, and largely out of pocket (web connection is spotty). The bulk of the debris will likely not be radioactive, as it was presumably washed out to sea during the initial tsunami - before much radioactivity had leaked. But this shows the power of the currents from Japan to the West Coast. Gundersen Discusses Current Condition of Reactors, TEPCO Claim of "No Fission" in Fuel Pool, and Lack of Radiation Monitoring in from Fairewinds Associates on Vimeo. Minot is best known as home to an Air Force base, which oversees 150 Minuteman III missiles in underground launch silos scattered over 8,500 square miles in northwest North Dakota. Col. S.L. Davis, commander of the 91st Missile Wing, said there was some "localized flooding" at a handful of missiles sites because of the wet spring and summer. 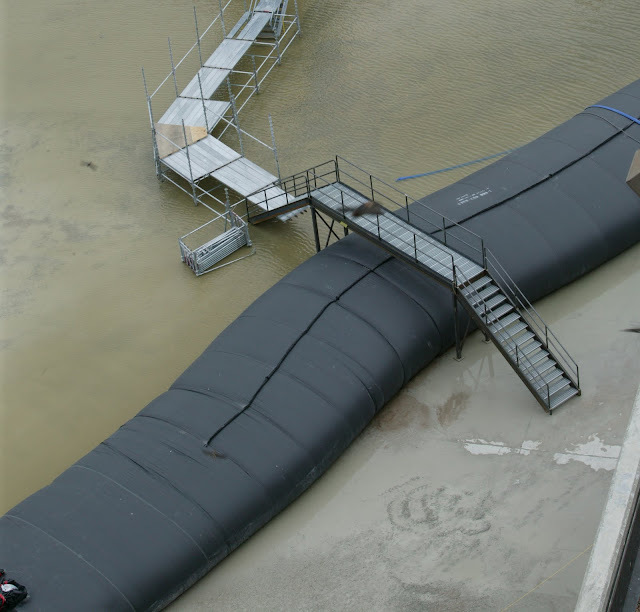 But he said the silos are designed to safely handle some water and protective measures were taken at a few sites similar to what's done in preparation for spring runoff from snowmelt. I don't think that nuclear missiles - unlike nuclear reactors - need to be cooled or need a constant electrical supply in order to avoid disaster. So while this sounds scary, I assume the risks are actually low. Is the Chinese Economy Sputtering for the Same Reasons as the American Economy? It was tempting to believe that China was different. With its command and control economy with some of the trappings of free market capitalism, trillions in reserves, and abundant natural resources, many thought that China would "decouple" from the Western world's problems and sail into a prosperous future. However, despite its long history, exotic names and seemingly strong position, China cannot avoid the rules of economics which have applied to all countries throughout history. The credit crisis hit in 2008 largely because American banks lost trust in one another. Specifically, top economists say that each bank had so much bad debt on its books (in the form of mortgage backed securities and derivatives which worth the paper they were written on) which made them essentially insolvent that they assumed that all of the other banks must be in a similar situation ... so they stopped lending to each other. This drove the price which banks charged each other for loans (libor) skyrocket, and the whole credit market froze up. The same thing is now happening in China. As ZeroHedge reports, Chinese interbank lending is freezing up and "shibor" - the prize which Chinese banks charge each other for loans - is skyrocketing. And if you think that bailouts as an attempt at stimulus are solely a Western game, think again. China is bailing out local governments, giving cash for clunkers, and trying just about every possible type of bailout. At the Haiyang Zhuangshi Co. hardware store in Beijing, sales of paint and aluminum window frames are slowing, one sign of a diminished role for consumer spending in China that’s foiling government objectives. Hu’s loss underlines the dilemma for Premier Wen Jiabao: his campaign to control inflation is undermining attempts to make consumers a bigger driver of the world’s second-largest economy. Failure to lessen dependence on exports and investment spending leaves the nation more vulnerable to swings in external demand and subject to asset booms and busts. Government data this week showed retail sales growth slowed to 16.9 percent in May, less than the average of the past five years and a figure that’s inflated by soaring prices for food. By contrast, spending on fixed assets such as factories and property climbed 26 percent, excluding rural households, in the first five months, the fastest pace in almost a year. Analysts at Capital Economics, a London-based research group, estimate that private consumption may have fallen to 34 percent of gross domestic product last year, the lowest level since China began opening its economy to market mechanisms more than three decades ago. Just 10 years ago, the share was 46 percent, Capital Economics calculates. One of the top experts on China's economy - Michael Pettis - has a[n] essay arguing that China is blowing a giant credit bubble to avoid the global downturn. America's easy credit bubble started in 2001. Rome's prior to 10 BC. We know the results of both. Is China now blowing a huge credit bubble which will lead to a giant crash down the line? Pettis thinks so, and every Austrian economist in the world would agree. While Americans are focused on the bursting of the American housing bubble, the bubble in residential and commercial real estate was global, including China. Where Did the Surplus Go? It shows that the entire environment everyone assumes we are operating in - China as the giant net exporter with huge trade surpluses - might not continue for much longer. In other words, "Chimerica" is starting to break up. And those huge Chinese purchase of U.S. treasuries are no longer guaranteed. After hitting record highs in 2009, China’s global trade balance is well below where it used to be and ticked up only modestly in the latest data. However, the headline number can be misleading: the trade surplus with the US continues to hit new highs while China is running massive trade deficits with the rest of the world. 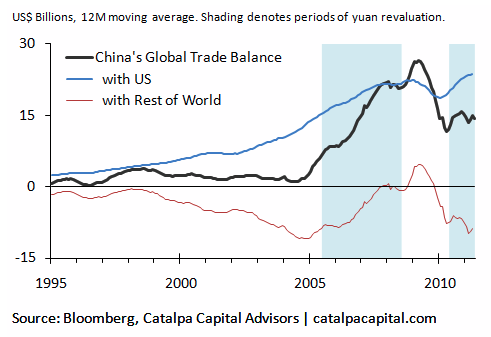 When all the math is done, without the US, China is running a trade deficit with the rest of the world (the red line). The renewed strengthening of the yuan against the dollar, however, has lagged the global surge in commodity prices. Because China is paying more for its commodity imports, the deficit with its non-US trade partners continues to grow. China has been buying US Treasuries for many years to finance its trade surplus with the US. China may need to continue doing so for some time to come to offset its trade deficit with the world ex-US and keep its overall trade balance stable. Westerners are also familiar with the debt problems of Western countries like Greece, Spain and the U.S. I started warning the day after the Japanese earthquake that radiation from Fukushima could reach North America. See this, this and this. Radioactive materials spewed out from the crippled Fukushima No. 1 Nuclear Power Plant reached North America soon after the meltdown and were carried all the way to Europe, according to a simulation by university researchers. According to the research team, updrafts in a low-pressure system passing over the disaster-stricken Tohoku region on March 14-15 carried some of the radioactive dust that had collected about 1.5 kilometers above the plant to an altitude of about 5 kilometers. The jet stream then caught the dust and diffused it over the Pacific Ocean and beyond. I also have repeatedly pointed out that Tepco, the Japanese government and governments around the world covered up the extent of the Fukushima crisis. See this, this, this and this. Now even the International Atomic Energy Agency and World Meteorological Organization are complaining that they were unable to obtain necessary information from Japan about Fukushima, which led to difficulties projecting how radioactive materials would spread around world. However, this is somewhat disingenuous given that the IAEA and Nuclear Regulatory Commission knew within weeks that there had been meltdowns. The attempted cover up of the severity of the Fukushima disaster is nothing new. Governments have been covering up nuclear meltdowns for 50 years, and the basic design for nuclear reactors was not chosen for safety, but because it worked on Navy submarines ... and produced plutonium for the military. Finally, I've previously noted that the amount of radioactive fuel at Fukushima dwarfs Chernyobyl. Realize Chernobyl was one core’s worth radiation causing a $200 billion accident and it is still on- going. Here we have 20 cores worth of radiation. Three totally melted, one damaged and the [rest in] spent fuel pumps, 20 cores worth of highly radioactive materials. 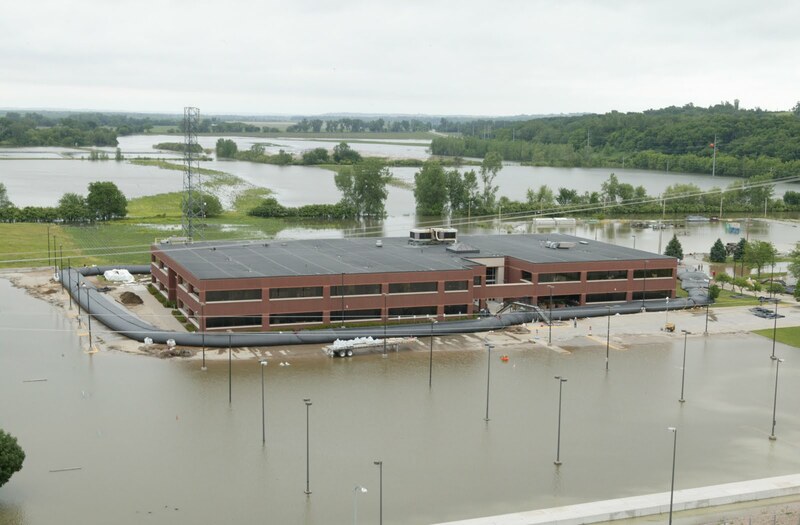 Although the Fort Calhoun plant ... is surrounded by an eight foot tall and 16 foot wide protective berm, two feet of water have already made its way to several areas of the Fort Calhoun plant, but authorities say there is no immediate danger at either plant. Parts of the grounds are already under two feet of water as the swollen Missouri overflows its banks. 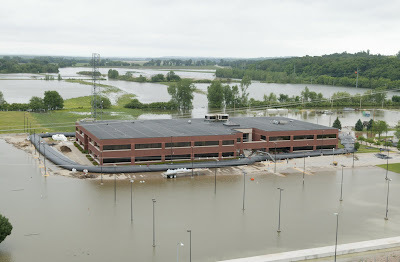 But the Omaha Public Power District, which owns the plant, has built flood walls around the reactor, transformers and the plant's electrical switchyard, the NRC said. 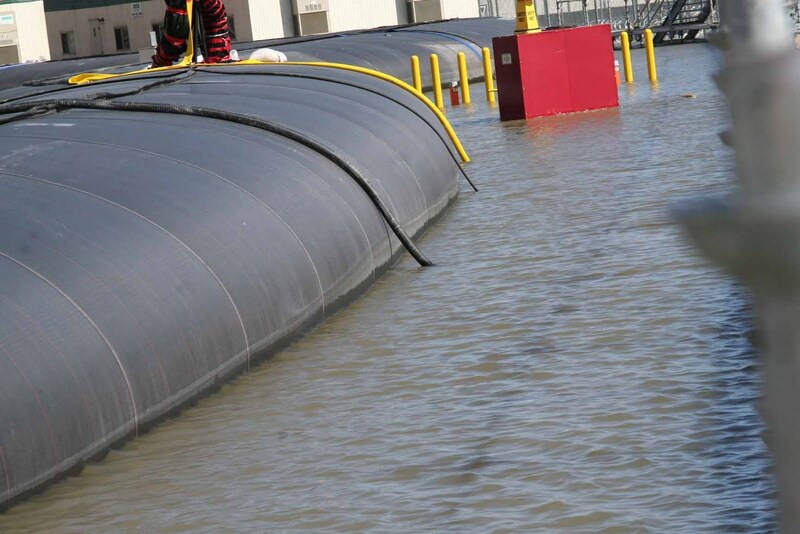 "They've surrounded all the vital equipment with berms," Dricks said.An 8-foot-tall, water-filled berm, 16 feet wide at its base, surrounds the reactor containment structure and auxiliary buildings, the NRC says. The plant has brought in an additional emergency diesel generator, water pumps, sandbags and firefighting equipment as well, according to regulators. 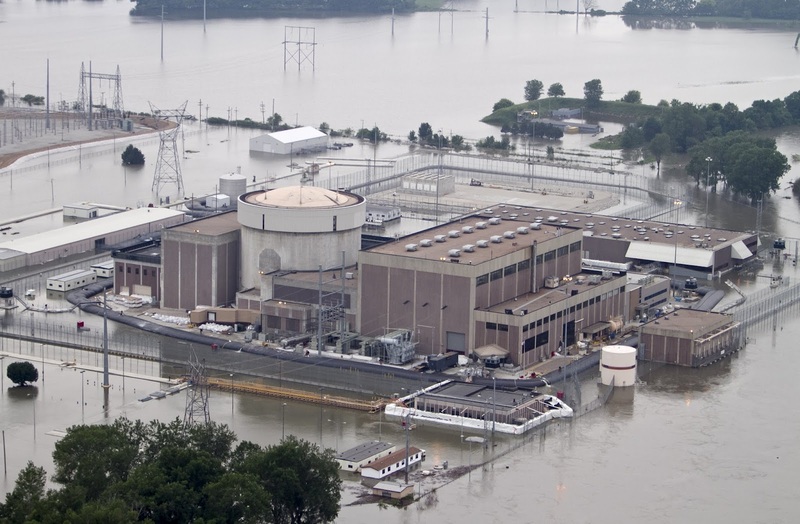 Fort Calhoun's chief nuclear officer Dave Bannister says that the river would have to rise another 3 1/2 feet above where it stands now to pose a danger to the reactor. See this and this. We don't have a precise read on why this slower pace of growth is persisting. Well, it is obvious to anyone who has been paying attention what's causing the slow down, and if Mr. Bernanke doesn't know, he should be fired. As I've repeatedly explained since 2008, all independent economists and financial experts know why the economy is weak ... and everything the Fed has been doing has been weakening it. By failing to break up the giant banks, governments are forced to take counter-productive emergency measures (see this and this) to try to cover up their insolvency. Those measures drain the life blood out of the real economy ... destroying national economies. Indeed, instead of directly helping the American people, the government threw trillions at the giant banks (including foreign banks; and see this) . The big banks have - in turn - used a lot of that money to speculate in commodities, including food and other items which are now driving up the price of consumer necessities [as well as stocks]. Instead of using the money to hire Americans, they're hiring abroad (and getting tax refunds from the government). No wonder we're suffering depression-level unemployment. Specifically, the New York Federal published a report in 2009 entitled "The Shadow Banking System: Implications for Financial Regulation". And yet, the Fed has been and continues to be one the biggest enablers for increased leverage. As anyone who has looked at Mr. Bernanke and Geithner's actions will tell you, many of the government's programs are aimed at trying to re-start securitization and the "shadow banking system", and to prop up asset prices for highly-leveraged financial products. As I noted in 2009, the economy is not getting better because government's policies are strengthening the parasite and killing the patient. Indeed, despite the Fed's responsibility to prevent certain types of fraud, it adopted a "see no evil" policy and winked at it. (Bernanke's predecessor as Fed chair, Alan Greenspan, adopted the non-sensical position that fraud could never happen, so the Fed shouldn't police for it). Inequality was another major cause of the 1930s Depression and today's lousy economy, but the Fed has done nothing to even things out. Indeed, inequality is currently worse than during the Depression. Indeed, the Fed has given trillions to the biggest banks, and virtually nothing to main street. This has gone to Wall Street bonuses and made the big banks' executives richer, but the rest of us poorer (and it hasn't help the economy). If Bernanke can't see it - or won't admit - he should be fired.